We have a wide selection of grocery items for you to choose from. We feature national brands and great private label items. 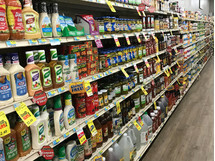 Check out our dollar aisle for great economical goods. We can help feed every member of your family as we also carry a variety of pet foods.